What’s wrong with sharing? What’s wrong with courtesy? Dan Gutierrez’s graphic illustration (CVC are references to the CA vehicle code). 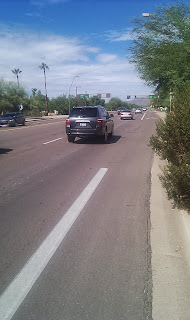 Should Warner Road bike lane have a “Combined” Turn Lane? 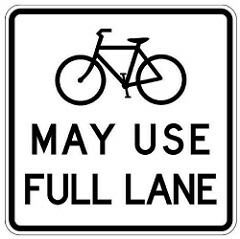 A standard sign with placard, “legalizes” thru-bike usage. 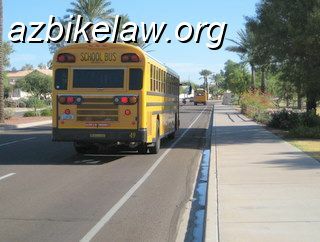 it is a common occurrence — familiar to every bicyclist — where you can be riding along a perfectly nice bike lane only to have it disappear for various reasons. Bike lanes are highly prized for making cycling “more comfortable”; so I think it’s safe to say disappearing bike lanes would be considered quite stressful, and an impediment to cycling for many cyclists. Here is the MUTCD home page, where full versions of the document are published. 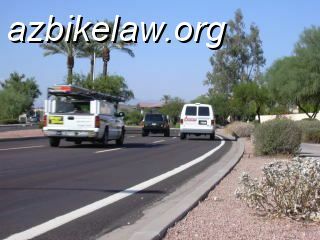 Most of what is of particular interest to bicyclists is in Chapter 9. 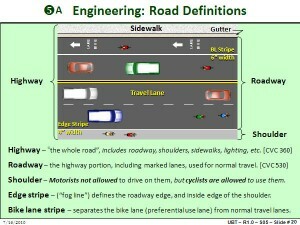 Walkinginfo.org has a webinar presentation that outlines the changes in the 2009 version of MUTCD. H. Gene Hawkins, Jr., Ph.D., P.E. has an extensive history of the MUTCD. This book gives the accepted guidelines for dimensions and usage of various bicycle facilities, i.e. bike lanes, wide curb lanes. Is this a bike lane? 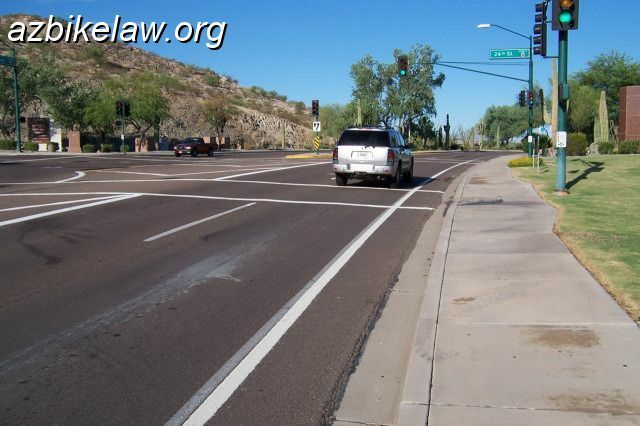 What is the correct — both legal and safety — position for a cyclist to assume in these not-bike lanes? Just try to get a straight answer out of the-powers-that-be (in this case, the City of Phoenix) on that one. 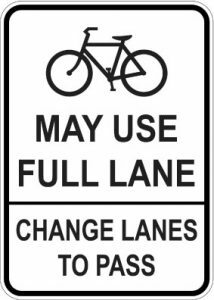 The law is refreshingly clear: “If the lane…is too narrow for a bicycle and a vehicle to travel safely side by side within the lane” a cyclist may ride anywhere in that lane, §28-815(A)(4). Photo Red Enforcement found ‘illegal’? Well, not exactly. After an article in “theNewspaper.com” (“a journal of the politics of driving”… an anti-photo enforcement website), the local anti-photo enforcement blogosphere Camera Fraud has declared that a FHWA letter will be “will be sending shock waves through the insidious network of red light cameras across the country”. 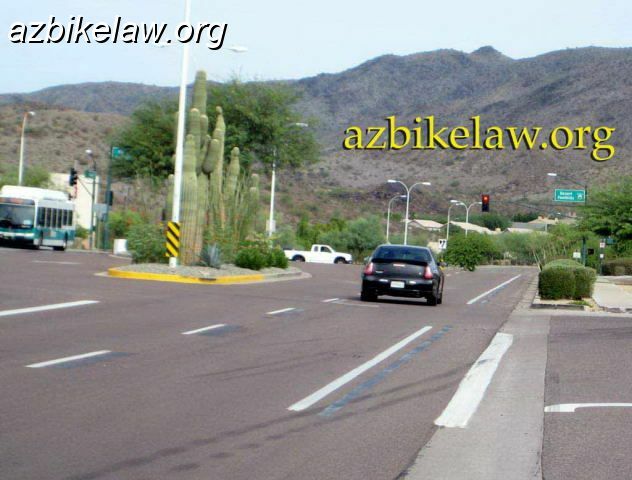 Despite the camera-foes’ protestations to the contrary, the FHWA has no legal standing, can not make laws, and is not a legislative body (For Arizona, the Arizona state legislature is); the only tie to the law is through the MUTCD; and “violations” of the MUTCD are common. In any event the FHWA interpretation letter refers to the extra ground markings in use being dis-allowed, and not cameras.